Police said alarms at Fashion Place mall were malfunctioning before a Sunday shooting. Now the mall says that wasn’t true. (Rick Egan | The Salt Lake Tribune) Police clear everyone out of the Fashion Place Mall in Murray after a shooting at Sunday, Jan. 13, 2019. Seconds before a gang-related shooting at Fashion Place mall on Sunday, the fire alarms went off by the food court where hundreds of people sat eating hot dogs and pretzels. Employees there have said the alarms go off often, at random intervals and without explanation. So they typically ignore them. And largely no one else responded to the blaring noise either. Shoppers continued as normal until the sound stopped. Then came the pop-pop-pop of gunfire. After reviewing the incident, police concluded that the Murray mall’s alarm system was broken. It went off having “nothing to do with” the shooting, officers said, and appeared to be caused by an ongoing malfunction with the technology. Mostly, it just added to the sense of confusion. But a spokeswoman for Brookfield Properties, the corporate owner of Fashion Place, and the mall’s senior general manager responded Tuesday, defending the alarm system and saying it was working. The alarm went off Sunday in the food court because it detected smoke, they said. However, manager Mark Thorsen conceded, the mall should have done better in informing its employees why the fire alarms were going off, on that day and in the past — so that they wouldn’t assume the system wasn’t working and dismiss the alarm, and so they’d be prepared to respond safely. Lindsay Kahn, spokeswoman for the property company, said it was “an unfortunate coincidence” that the alarm went off before the shooting, which happened outside a southeastern entrance of the mall at 6191 S. State. Two people were injured — a woman shot in the leg, who has since been released from the hospital, and a man hit in the back, who is in critical but stable condition after surgery. Two men said to be involved with the Florencia 13 gang have been arrested. "We just want to clarify things for the community,” Kahn said. Mall staff had announced on the intercom system when the smoke, the cause for the alarm, had been cleared, Thorsen said. Seconds later, though, he added, when the shooting started, the mall used the PA system again to tell shoppers to evacuate or shelter in place. 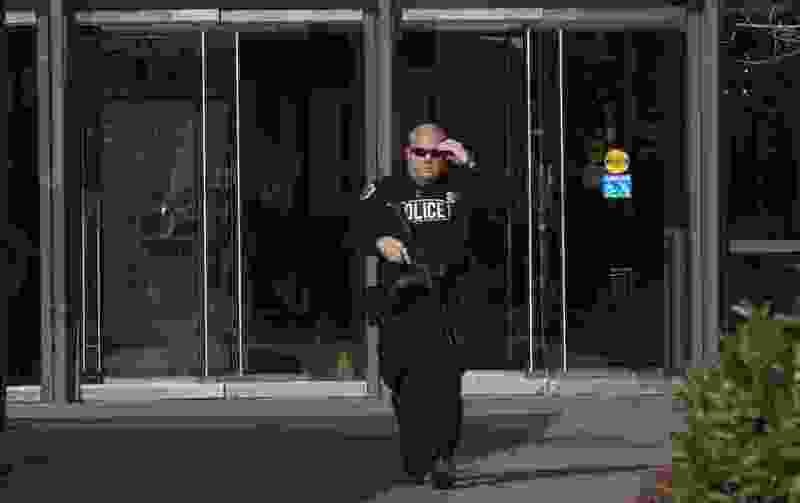 There was no alarm noise connected with that message; it repeated an announcement to “run, hide fight” that experts advise for active shooter scenarios. Abbigail Loveridge, who works at the store Attic Salt, told The Salt Lake Tribune on Sunday that she initially disregarded the alarm because it’s common for pranksters to pull it. It sounds fairly often, she said, and usually isn’t connected to an actual emergency. In addition to telling employees why the alarms are going off, management intends to continue training “as an ongoing thing,” including for kiosk employees. Thorsen said those workers — some of whom have said they were never trained for this kind of situation — received an email before the holidays with a video explaining procedure. But the mall intends to provide more information as it re-evaluates after the incident. Fashion Place is also working with the American Red Cross to provide counseling for any workers who are struggling after the shooting. And Murray police have advised anyone who needs resources to call its advocates at either 801-284-4201 or 801-284-4203. Officers arrested Jesus Joshua Payan-Mendoza and Jorge Luis Crecencio-Gonzalez, both 19, early Monday morning in connection with the attack. Murray police Officer Kenny Bass has said the two were part of a gang that “incidentally” bumped into a rival gang at the mall about 1:30 p.m. Sunday. The two groups got into a physical fight, and Florencia 13 gang members “turned and fired,” hitting the man and woman, who are in their early 20s. It’s unclear whether either of the two teens who were booked into jail fired a gun during the attack, Bass said, but a probable cause statement says Crecencio-Gonzalez drove a getaway car. Both are being held on suspicion of attempted homicide and felony discharge of a firearm. Payan-Mendoza and Crecencio-Gonzalez have a handful of past traffic tickets in the court system as adults. Payan-Mendoza also has a juvenile criminal record that includes felony counts for rioting resulting in injury and aggravated assault using a weapon or force stemming from August 2016. He was also accused of misdemeanors for assault, criminal trespassing on school property and joyriding. The cases ended in probation, which included community service, restitution and required classes about drug and alcohol use. With the exception of the two who were wounded — police are not releasing their names but have said they were members of a rival gang — another eight to 10 gang members fled the area, Bass said. Police continue to search for those individuals, as well as any witnesses who have information or cellphone video of the incident. 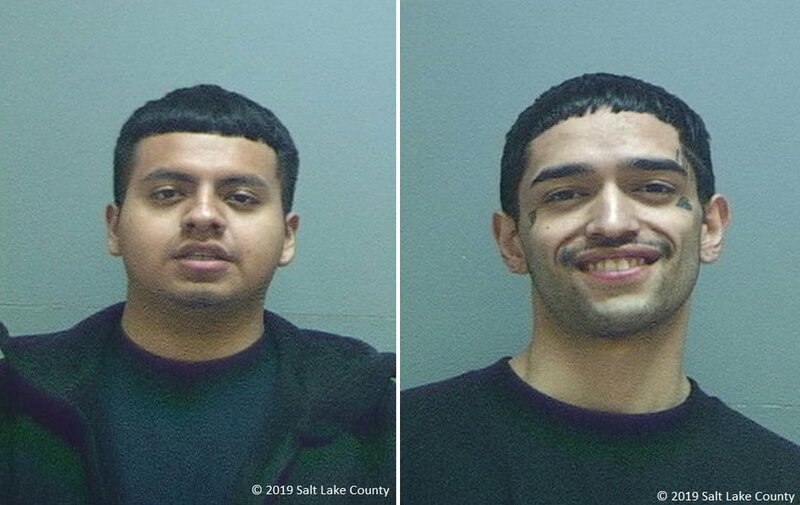 (Photos courtesy Salt Lake County Jail) Jorge Luis Crecencio-Gonzalez (left) and Jesus Joshua Payan-Mendoza.